Designed with the Outdoorsman in mind! Click on the arrow below to watch a video on the Ultra. 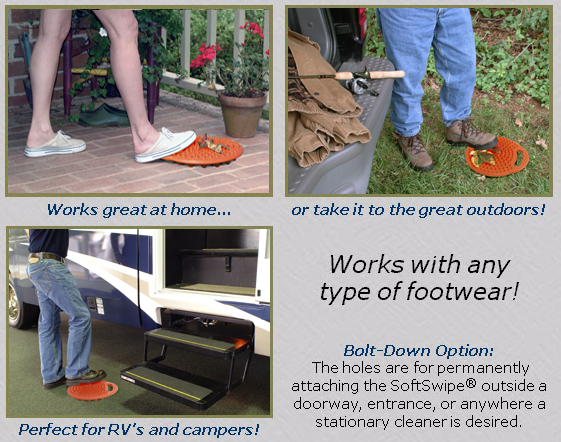 on the ground while you swipe your shoes or boots free of debris. Take the SoftSwipe® "Ultra" with you....it's Portable! Great for any field sport! Football, Baseball, Soccer, Lacrosse, etc. Widely Used by the NFL and NCAA football programs! The SoftSwipe® has been modified to become the only cleat cleaner functional on turf, synthetic surfaces, and outside the locker room. The bottom rods have been shortened for improved stability on carpeted sidelines, canvas, astroturf, and grass. Also, holes have been added to it can be mounted outside the field house or locker room entrances. PORTABLE OPTION - Simply drop the durable, 12" rubber-molded disk (shorter rods down) on turf, canvas, or any synthetic surface and swipe mud and debris from your cleats. Traction is restored! BOLT-DOWN OPTION - Holes have been added to the disk so that it can be permanently mounted outside a field house, locker room, or building. Keep your facilities clean!! 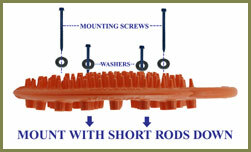 Weight: 3.25 lbs., Diameter: 12 in., Thickness: 2.5 in.